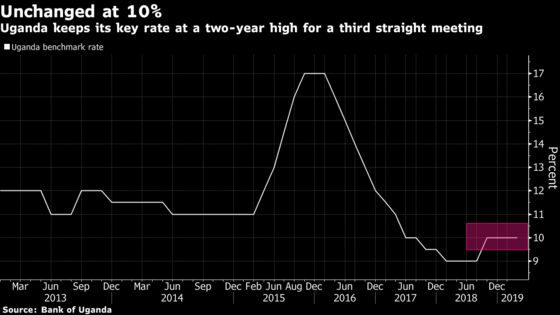 (Bloomberg) -- Uganda’s central bank kept its key rate at a two-year high for a third straight meeting as it sees inflation edging higher. The Monetary Policy Committee held the rate at 10 percent, Governor Emmanuel Tumusiime-Mutebile told reporters Monday in the capital, Kampala. Consumer-price growth was unchanged at 3 percent in March and the central bank sees the rate remaining close to 5 percent in the next two to three years. Inflation will probably peak at 6.3 percent in the third quarter of 2021, Tumusiime-Mutebile said. “The risks to the outlook include the future direction of food crops prices in the wake of uncertain weather conditions, the strength of domestic aggregate demand and the path of the exchange rate,” according to a statement read by Tumusiime-Mutebile.